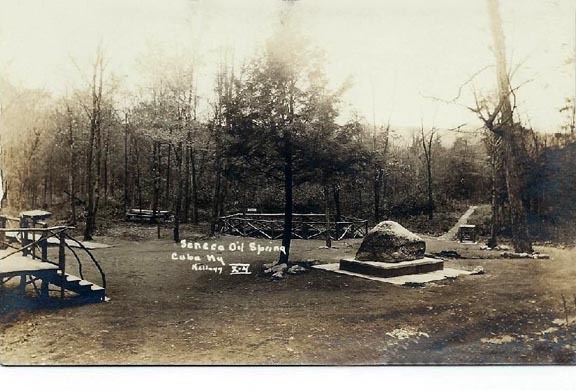 Seneca) Oil Springs Reservation is situated on the boundary between Cattaraugus and Allegany counties near Cuba, NY. It was originally surveyed to comprise a mile square around the famous oil springs the Seneca used to cure illness. No Seneca live at Oil Springs at present, the entire area being leased to non-Indians. In 1990 the Federal Census showed the population as 2 !! However, in the 2000 Census the population had grown to 11. The spring is located near the spillway end of Cuba Lake on the Oil Spring Indian Reservation. 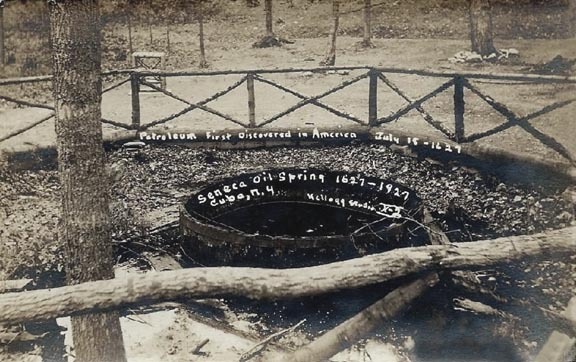 This is the site of the famed spring described by the Franciscan Missionary Joseph DeLa Roch D'Allion in 1627, the first recorded mention of oil on the North American Continent. 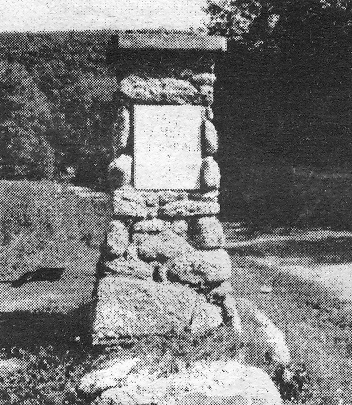 In 1927, the New York State Oil Producers Association sponsored the dedication of a monument at the site describing the history of the oil industry in North America. In recent years, Allegany County has discussed at Legislature Level a proposal to elevate the upkeep of the grounds, but, to date has spent “minimum funds” on the driveway & parking area for visitors. (From 1806-1879 History of Allegany County, N.Y., F.W. Beers & Co) “With the celebrated Oil spring on Oil creek, two miles from the village of Cuba, most who read this are somewhat familiar. Its character is peculiar. “It is a curious fact,” says Turner in his History of the Holland Purchase, “and demonstrates how wide was the range of the French Jesuits and traders over the regions of western New York, that Joncaire knew of the existence of this spring and described it to Charlevoix in 1721. The mile square of land embracing it was one of the reservations of the Seneca Indians, in their treaty with Robert Morris. The Indians regarded it of great value; attributed important medicinal qualities to the oil; in early years, after settlement commenced, it was a place with them of frequent resort. They used to spread their blankets upon the water and wring them, collecting the oil in their brass kettles. Soon after the settlement of the country the oil was collected and sold, and has been in use more or less for nearly fifty years, though it is not certain that it possesses much virtue. The waters of the spring are pure and cold, not tainted with oil. When the oil is skimmed off it will accumulate again on the surface in an hour. It has a strong bituminous smell; in appearance it is not unlike the British Oil”. Photos below are submitted by and our Thanks to Friends of History, Ford Easton and William A. Greene. Above, A Kellogg Studios (X-2) photo taken in 1927. Studios (X-4); believed dating was 1927. On the 22d of this month I visited the Oil Spring, in company with Wm. Mitchell, Esqr., of Middlebury, and Dr. Champlin of Cuba. We not being in possession of means for analyzing the water, had to content ourselves with barely a superficial examination of its presence. This spring, or pond, (for there is no outlet,) is situated about two miles from the turnpike road, on one side is a high hill, which appears to be the western extremity of a range of hills which run near to and parallel with Black Creek, in the bowels of which the inhabitants suppose there is a coal mine. This spring is about 42 feet in circumference, and has a circular form. Its depth is not yet ascertained, although poles have been sunk in 30 or 40 feet. The vapor that arises from the spring is supposed to be highly impregnated with carbonic acid gas. When it is inspired for any length of time, it impedes respiration. The water has a greenish cast; its smell resembles British oil. The oil, when first collected, is likewise green. When it is spread thinly, it turns white; and by being exposed to the action of the air and sun, quickly turns black. It will burn equal to lamp oil, and is said to be very beneficial on rheumatic complaints, sprains and fresh wounds. The soil about it is alluvial; its products are the fir tree, hemlock, some pine, symplocarpus foetidus, or skunk cabbage, together with all the different plants which usually grow on this kind of soil. The Indians have reserved one mile in diameter, in the middle of which stands this spring. We regret that the respectable Medical Society of Allegany have not, before this time, adapted measures for the analyzing of this oil, these waters, and this gas. They know not what benefit they might derive from knowledge of the properties of this treasure of their county, and never will know, till such measures are adopted. J.G.H.